The Urban-X investors showcase is a closed-door event that shows off eight different incubated startups to potential investors and press. I stopped by earlier this week to see what the fuss was about. Of the eight companies in Urban-X’s 02 cohort, I picked four that tackled problems relating to pollution, the visually impaired, urban deliveries and maintaining public cleanliness: O2O2 Facewear, WearWorks, Upcycles and Sencity, respectively. Perhaps the potentially life-changing of the products and services demoed at the Urban-X showcase is by WearWorks. Their prototype wristband is a proposed solution to GPS-based navigation for the blind and visually impaired. 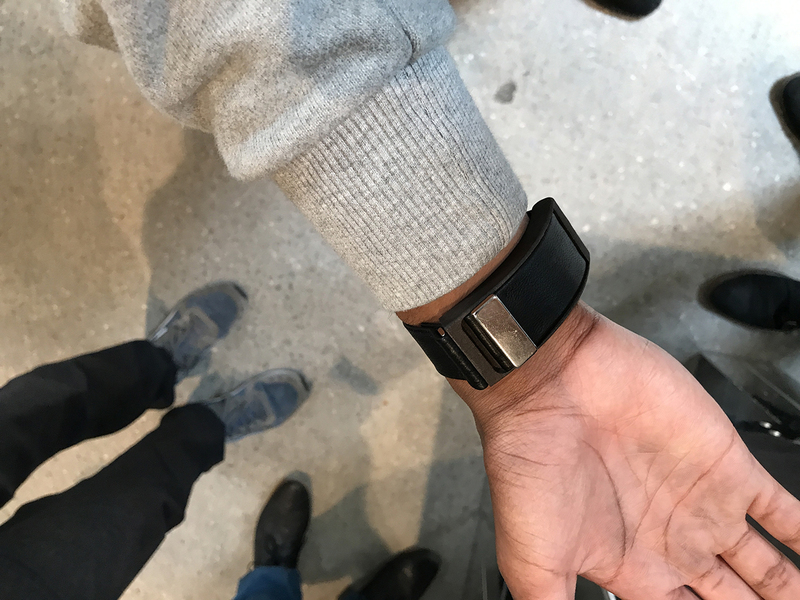 Using haptic feedback, the WayBand uses a powerful motor to give you tactile sensations about where you are and what direction to walk in. WearWorks has been working with a number of visually impaired individuals to test the Wayband, including an ultra marathon runner who will be competing in this year’s NYC marathon. If the marathon test proves successful, WearWorks will begin seeding more devices to early adopters before moving forward with a public launch. Modern facewear company O2O2 is capitalizing on what they’re calling a “multi-billion dollar industry”. They’re focusing first on cities like Beijing, where pollution and air quality is among the worst of the world’s major cities. Oddly, O2O2 didn’t allow attendees to try on the mask (claiming that it was only formulated for the creators’ facial structures for now). However, O2O2 is promising four different facial molds at launch with customizeable modules (the unit you see above is an engineering prototype) that include the sensors, filters and batteries. 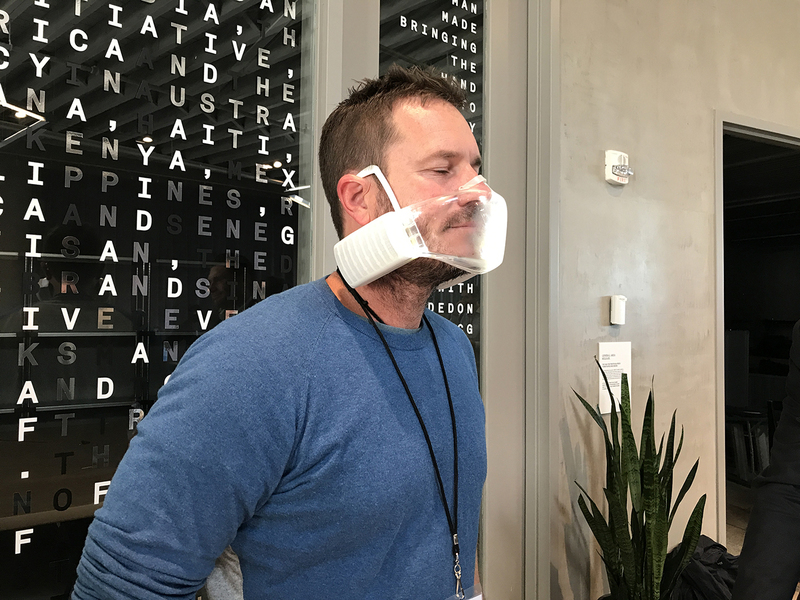 The coolest feature about the mask is that it’s possible to monitor your vitals (I’m assuming this is your VO2 breathing stats), as well as monitoring the air quality data with a companion smartphone app. The resulting data collected by O2O2 mask wearers can then be used to tackle the pollution problem in a given area, including determining which parts of town have the most pollution from day to day. The first thing Upcycles said on-stage is that they’re human centric and anti-robot. This piqued the interest of the crowd, but what actually made people curious was the Yax, a new type of urban delivery vehicle. 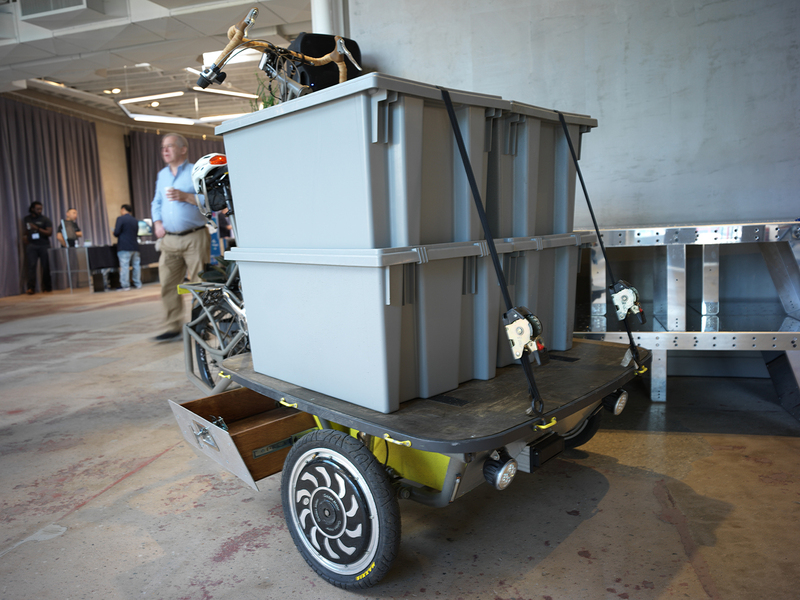 Designed to carry up to 500 pounds of equipment up and down tight city streets, the Yax is a weird looking tricycle with a flatbed. A delivery person riding the Yax has full visibility above and around their seating position, with the ability to secure the Yax like you would any other bike. The age of the..digital trashcan? Perhaps the most niche of presentations came from Sencity, with the TetraBIN. Some of Sencity’s design work has been used at embassies and malls in Australia – at heart, they are a design firm. Now they’re looking to tackle cleanliness in city streets by making trash cans interactive and visually appealing. 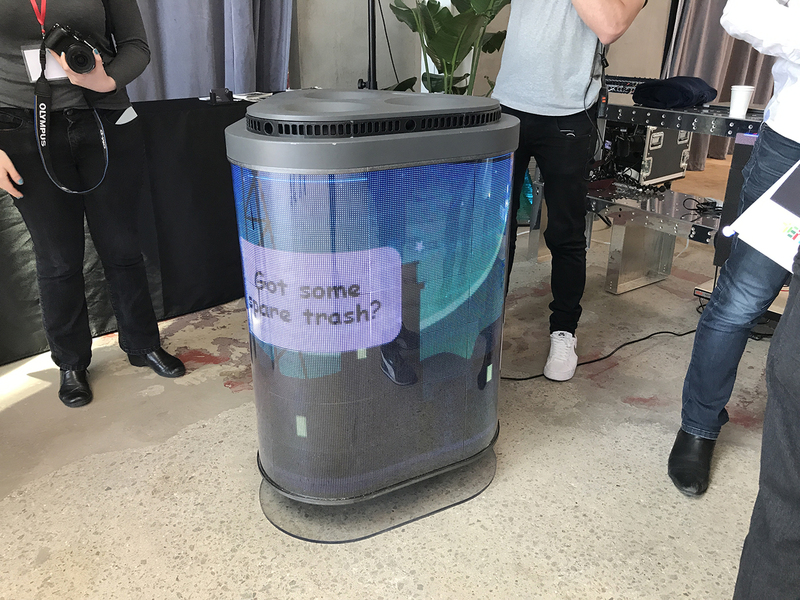 The TetraBIN does this with sensors, a speaker, microphone and a full LED screen wraparound, so it’s perhaps the most high-tech trashcan you’ll ever see. A passerby can not only throw trash and get a fun visual to look at, but ask for directions to get a cup of coffee, or be visually guided on which of the bins to throw in recyclables and regular trash. How useful this will be in a city like NYC, time will tell. My main concern with such a product is that it could get…trashed.